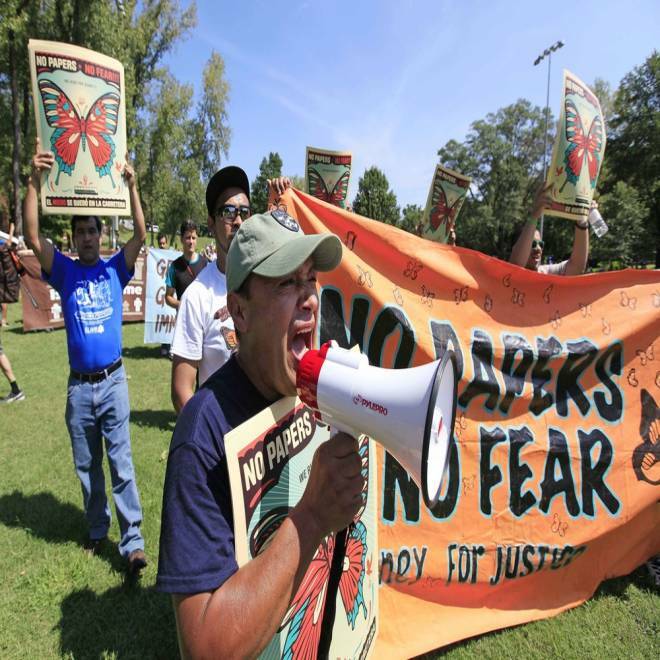 Demonstrators gather at Frazier Park at the start of a protest march Sunday in Charlotte, N.C. Updated at 6:18 p.m. ET: About 800 people chanting and carrying signs (among them, "Banks got bailed out. We got sold out") marched Sunday through the central business district in Charlotte, N.C., ahead of the Democratic National Convention to protest what they said was seedy corporate influence on politics. The protesters, who came from across the country, gathered at Frazier Park for a round of speeches before starting the march. They were from a coalition of more than 80 local and national groups. Media packets declared the group's mission as "building peoples' power during the DNC. Demonstrators had signs indicating that some were union workers, anti-war veterans and undocumented immigrants. "Capitalism is holding back the human race," one sign read. "Bail out people, not banks," another sign said. Hundreds of chanting protesters march through uptown Charlotte, N.C., ahead of the Democratic National Convention. WCNC reports. The protest route was to take them past the corporate headquarters of Bank of America and a major office hub for Wells Fargo – financial institutions that some see as symbols of foreclosures and federal bailouts. Protesters also planned a stop at the headquarters of Duke Energy, the nation’s largest utility. Duke has been criticized for investing in nuclear energy and using coal, according to the Charlotte Observer. Protesters have asked the company to focus on wind and solar power, which emit less carbon into the atmosphere. Duke, in defense, says it aims to retire its older coal plants. Uniformed police officers on bicycles and on foot kept a close eye on the marchers. At least two people were arrested -- one for wearing a mask and carrying a concealed knife, and another for assaulting a government official, disorderly conduct and resisting arrest, the Observer reported. Ray Suarez, of PBS NewsHour, tweeted, "Just watched Occupy et. al. march through Charlotte, who were in turn watched by enough cops to invade a small country." Before the main event began, a small press conference was held highlighting a woman, Sylvia Sanchez, who says she must pay $20,000 to Bank of America by Sept. 14 to avoid foreclosure on a home she's owned for 12 years. The woman, whose daughter is suffering from a brain condition called hydrocephalus, said she is in debt after having retrofitted the home with wheelchair ramps. In interviews with NBC News, rank-and file-activists cited different reasons for coming. Kendall Hale, a massage therapist and Obama campaign volunteer from Asheville, N.C., said that climate change was among her concerns. "The era of compromise may not be working so well," Hale said. She urged President Obama to "forge ahead with the issues [he's] speaking about so eloquently." Andie Marion, a college student also from the Asheville area, said her chief concern was "money in politics." "The amount of corporate power that influences a lot of the politics I think is really huge," she said. On the sidelines, Sunday's protest in Charlotte triggered a conversation about where the Occupy movement is headed. Todd Gitlin, who wrote Letters to a Young Activist and Occupy Nation: The Roots, the Spirit, and the promise of Occupy Wall Street, told NPR: "The initial wave moved its metaphors into the household conversation and shaped politics. But I think they essentially reached the limits of what they could achieve. Now there's a sorting process." The Democratic National Convention opens Tuesday in Charlotte's Time Warner Cable Arena. President Barack Obama will be nominated for a new term on Wednesday. He will deliver his acceptance speech Thursday night at the outdoor Bank of America Stadium. The convention starts less than a week after Republicans gathered in Tampa, Fla., to nominate Mitt Romney as the party's presidential candidate. NBC's Jamie Novogrod and Mark Potter and contributed to this report.